This handmade shaving bowl makes one nostalgic for the days of straight-edge razors and barber shops. SHAVE THE WHALES: We love this handmade shaving mug by San Francisco-based sheilasthings. 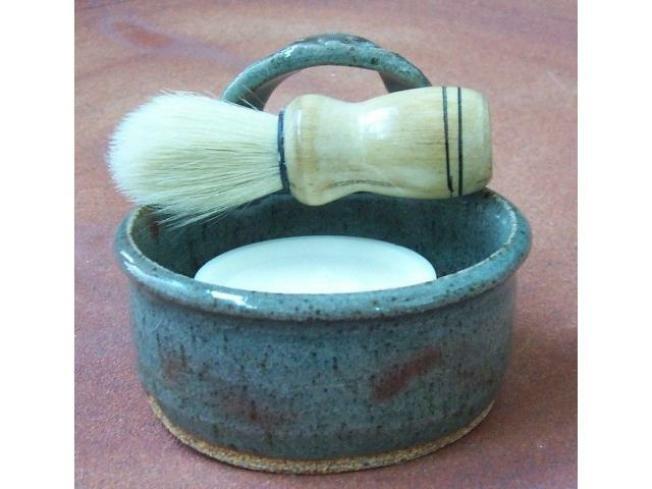 Not only is it a great gift, but it encourages eco-friendly shaving techniques by coming with a shaving brush and cake of shaving soap ($19.50). MORE NIDA FOR LESS: Clothing and accessory store Nida in Hayes Valley has marked down their summer collection by up to 70%. Be sure to check out their collection of adorable shoes as well. SAMPLE SALE: If you like BCBG and Ella Moss (who doesn't? ), you've got to check out the sample sale going on at the Fort Mason Center in San Francisco this weekend. It runs from 10 a.m. to 4 p.m. Saturday and Sunday, and admission is free. YARD SALE: Savvy yard sale shoppers understand the thrill of sifting through someone else's loot to find a fantastically cheap accessory or object d'art. Try your luck at Treasures in the Gardens, a neighborhood yard sale in Menlo Park held by the Allied Arts Guild. Admission is free and the sale runs from 11 a.m. to 4 p.m. on Saturday. NICE JEANS: Need a new pair of jeans? Head over to The Village at Corte Madera on Saturday between 11 a.m. and 1 p.m. for The Great Denim Event. There will be champagne, finger foods, denim experts, and of course, lots of designer jeans. Admission is free.